George K. Roberts has been in the armed forces for the past 26 years. The last year was spent in Iraq defending our freedom by fighting terrorists. There he was hit by mortar fire and dogged many bullets while trying to simply stay alive. He came home to fight a bigger battle and a sharper bullet. While horseback riding at his home in Ranger, Georgia, he was thrown off his horse severely crushing his right leg. After calling 911, he was taken by truck to the main road over an hour away. There he met emergency service personnel that were waiting to take him to the nearest hospital in Calhoun, Georgia. His leg was repaired as best it could be and he was sent home to recover. He developed an infection which led him down a much more terrifying road. The doctors told him that due to the infection he had two choices: amputate the leg or contact William Terrell, MD at Pinnacle Orthopaedics. 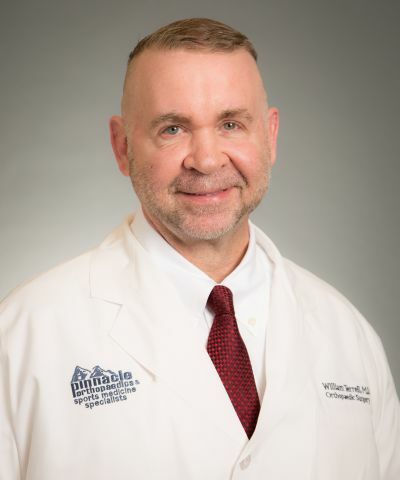 He chose the road to William Terrell MD at Pinnacle Orthopaedics and the rest is history. He was examined by Dr. Terrell who specializes in orthopaedic trauma, limb lengthening, and deformity correction. Dr. Terrell completed a trauma fellowship in Hanover, Germany and has received extensive studies in the Ilizarov Technique, an innovative surgery developed in Russia. Mr. Roberts says, "My whole life has really been changed because of their expertise and dedication. Dr. Terrell and his staff really cared about me and went the extra mile. They also taught me how to take better care of myself. First of all, Dr. Terrell insisted I quit smoking before the surgery, which has really helped me in more ways than one. It allowed me to heal better and has helped to speed the recovery." All in all, the whole experience has given Mr. Roberts a new outlook on life. He says he no longer takes the simple things for granted and wants to five fife to the fullest. After the surgery, his # 1 goal was to walk. Now that he has reached that goal, he wants to get his pilot's license and learn to fly. "My father builds planes and he and I are going to fly together." As of the date of this printing, Mr. Roberts has returned to active duty and is now serving our country in the armed forces. We salute him for his service and for his bravery. "My whole life has really been changed because of their expertise and dedication."